Rolling right into my next build I decided on something a bit more involved than the pretty simple Tamiya Wildcat I just finished. 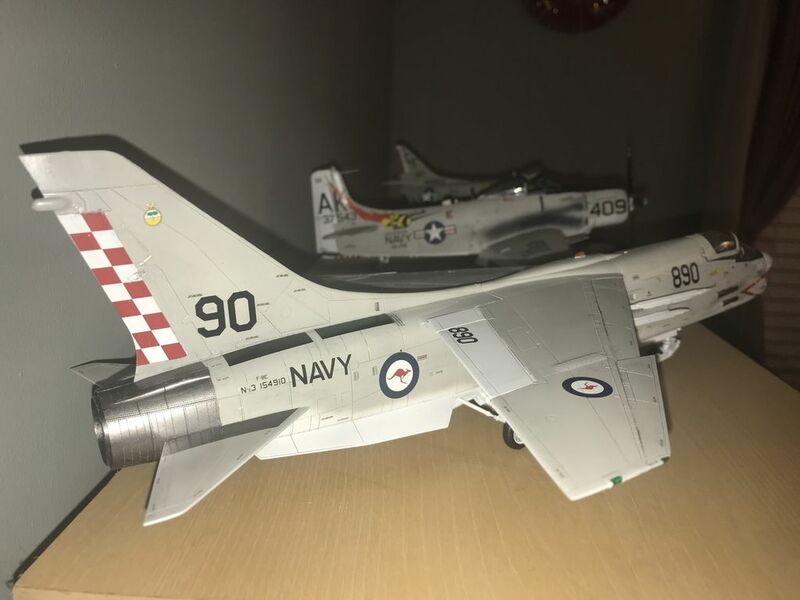 I got Eduard's impressive boxing of Hasegawa's F-8E on sale at Squadron.com a while back and have been itching to give it a go. 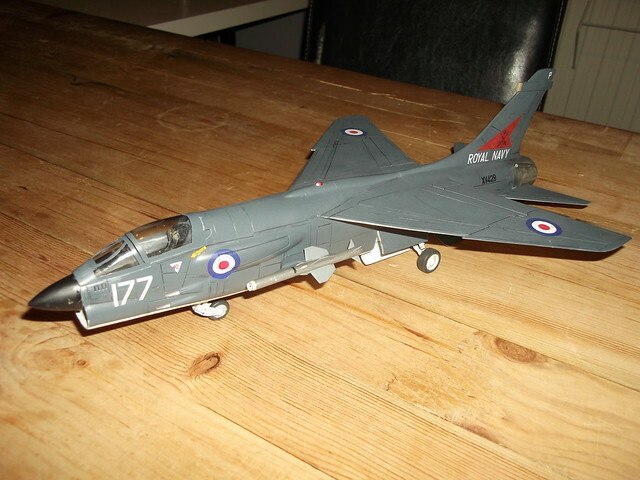 I've always loved the Crusader, but have only ever built one, which was an ESCI 1/72 version built for my very first One Week GB back around 2005ish I think. 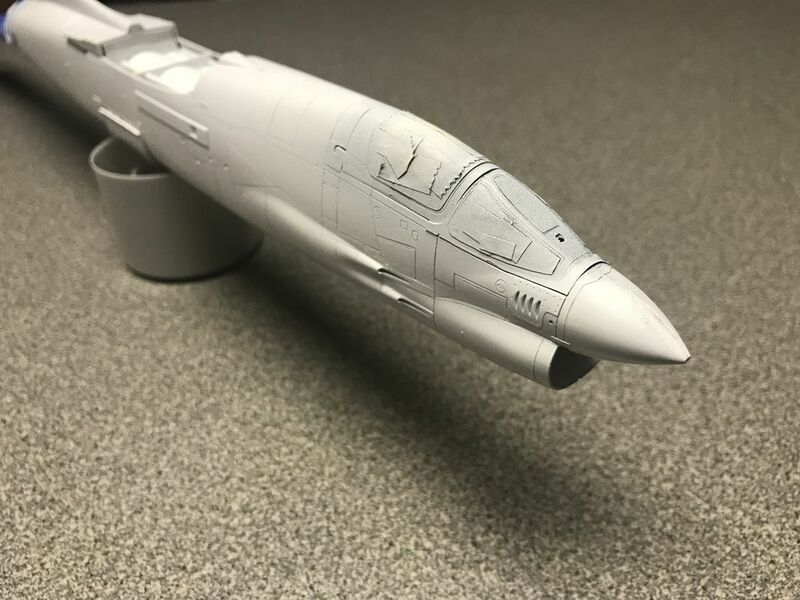 The PE and resin included in the Eduard boxing is very nice, and the decals have options for I think five Vietnam era airframes. I'm not sure yet how I'm going to finish it. 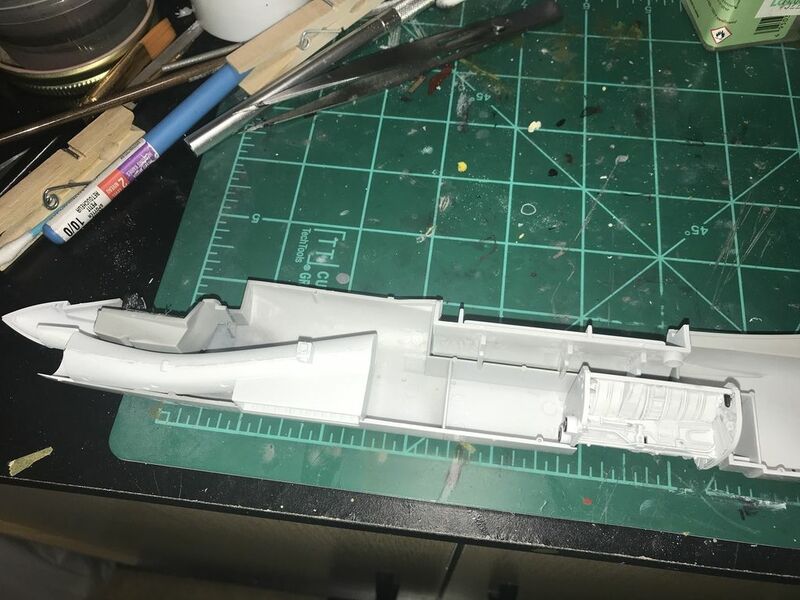 Since coming back to the hobby at the beginning of the year, this is still my favorite modeling site by far, but my interests lately have been more towards real world builds with the occasional Whif mixed in. We'll see how this one plays out...if I go RW it will be the colorful CAG bird from the kit decals. Other options I'm considering are RN EDSG over white, RCN EDSG over Sky, or standard USN Gull Gray over white but with Aussie markings. As I said we'll see how it plays out. I started 10 days off today, but I'm heading for a few days of R&R in Hawaii on Thursday, so after a little work tomorrow it will be on hold until next Tuesday. I'm actually surprised how quickly it's going together. 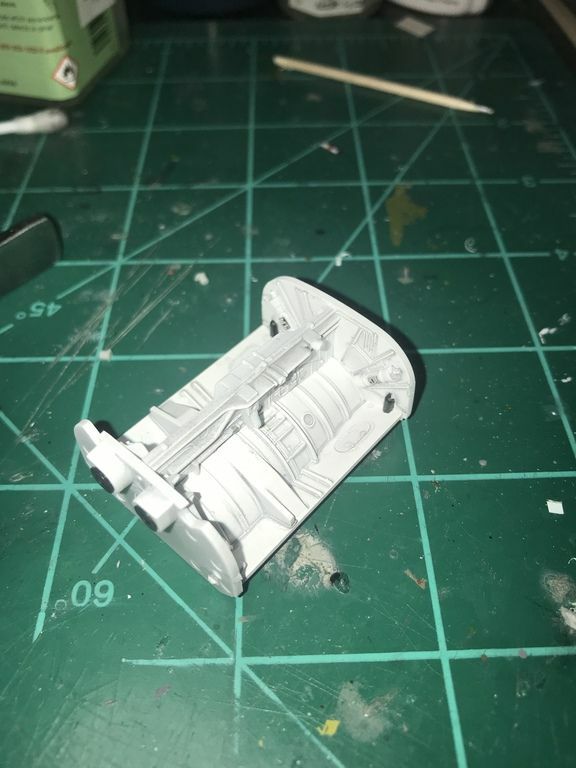 Today I got the cockpit done (easier than I thought with my limited PE experience), and the main gear bay painted and assembled (4 piece assembly with nice details and a little PE). 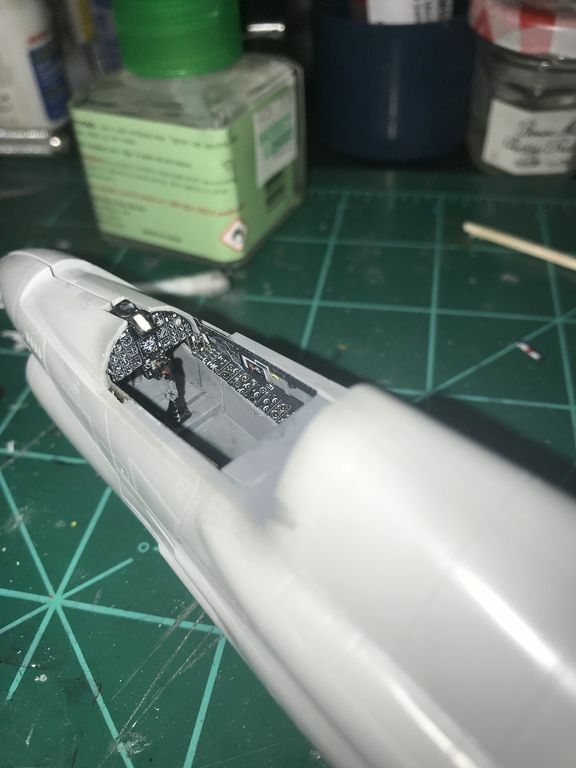 I'm going to build it with the wing down just because I think it looks better that way, so even though I painted the trunking under the wing white, I am not weathering or detailing it. The intake is also together. It went to together nicely with good locating pins in the fuselage. There was a seam, but repeated treatments with White Out (Tipp-Ex for the mother land) took care of it very easily, and since the intake is white it really doesn't take much other than laying it on. Nice PE for the cockpit. All the bits that go inside before it gets joined up. So many pieces to fit together seems a bit daunting, and not shown in this shot its the tail hook bay. 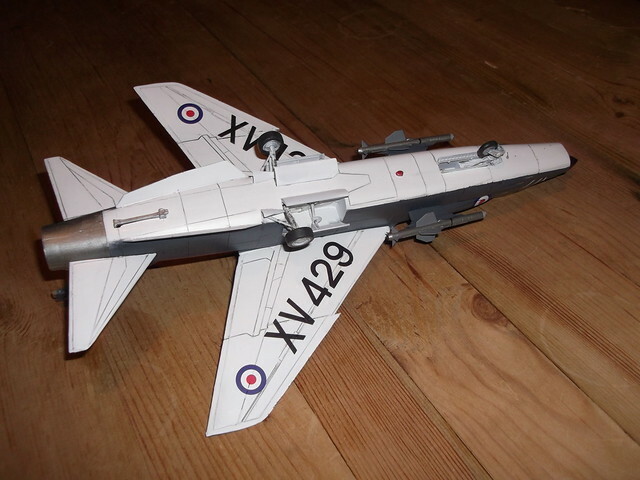 But with nothing glued in at all yet it all amazingly falls together and the fuselage dry fits together very nicely. Should have it all buttoned up tomorrow. I have this kit, it's going to be RAN but not sure what scheme, so I'll be watching to see how she goes together for you. 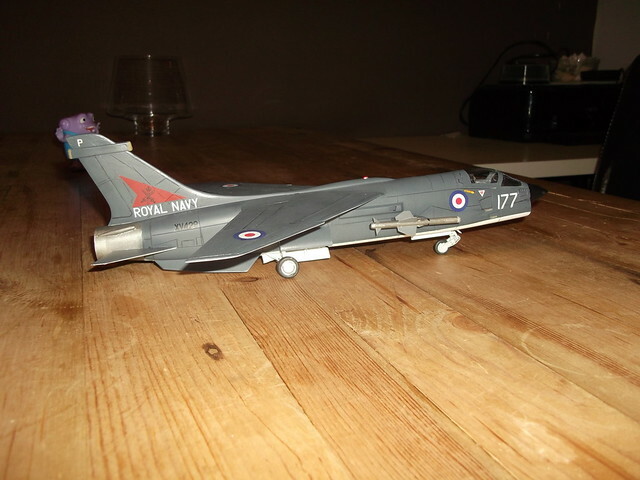 I did the old Ecsi 1/48 one in FAA colours last year, complete with Red Top missiles. It's been a busy few weeks so slow progress on this build, but with most of this week off for Thanksgiving I'm making some progress. 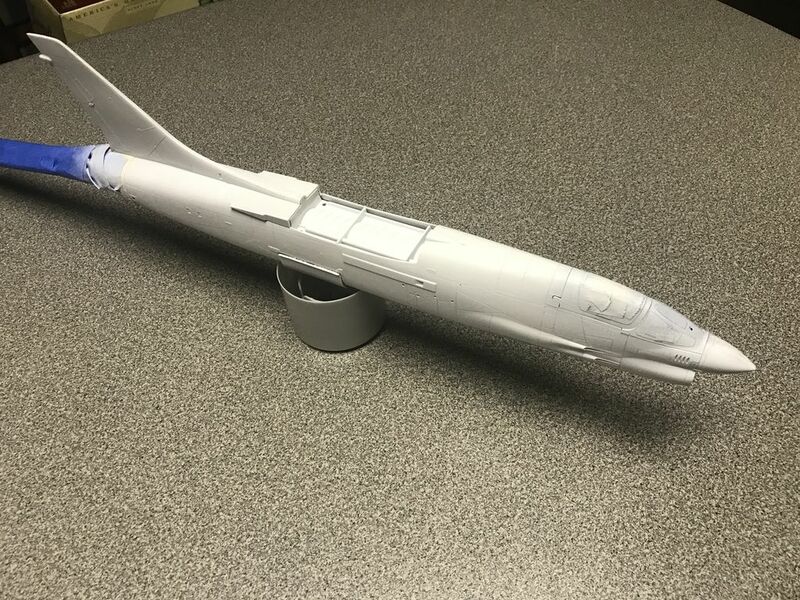 Fuselage is done, as is the wing, but I'm keeping them separate until final assembly to ease painting. The Tamiya white primer coat is mostly on...another thin coat for luck to go I think. Now the hard part starts...what goes on top of the white? Torn between three options right now. 1. OOB USN CAG bird (love this scheme). 2. Standard USN Gull Gray over White paint, but RAN markings, similar to how the A-4s were. 3. White on the bottom, Extra Dark Sea Grey on top for a late 60s RN Crusader operating from the Malta Class carriers. 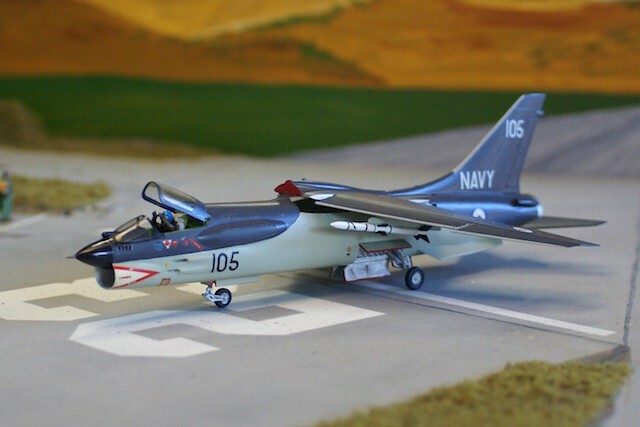 The RN acquired Crusaders in a deal that saw the USN purchase Buccaneers for the USN's carriers that were too small for the A-6 Intruder. This led to a common Crusader/Buccaneer air wing on at total of 8 USN and RN carriers. Time to put my thinking cap on...meanwhile two boring pics for your viewing pleasure. No such thing as a boring picture of a Crusader (or a SLUF)! Cold, rainy day off here in the Carolinas, so some good modeling progress. I love the classic Crusader look of Light Gull Gray over White, so that is what I went with. 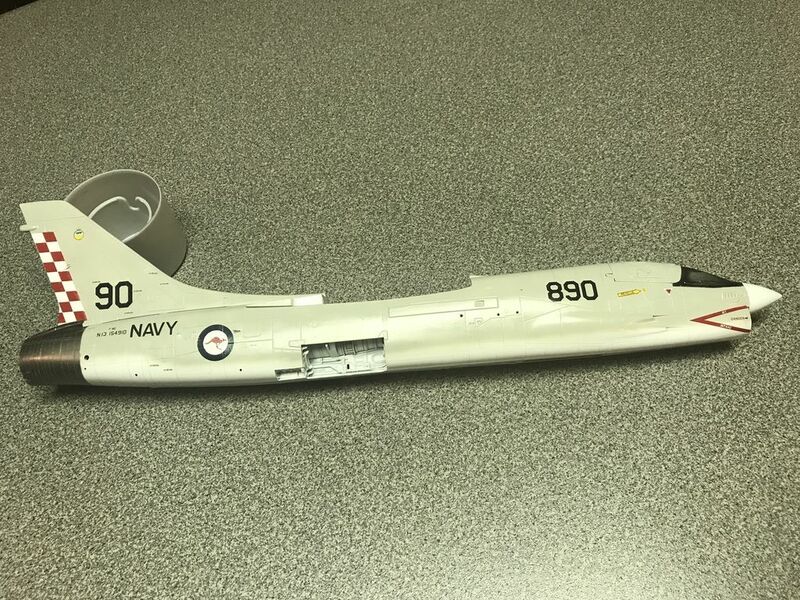 But instead of an OOB RW build it will be a Crusader serving with VF-805 of the Royal Australian Navy c.1966 aboard HMAS Canberra (ex-USS Tarawa). I'm thinking she will be carrying a pair of Sidewinders and maybe Bullpups on the underwing pylons. Well it's "mostly done". 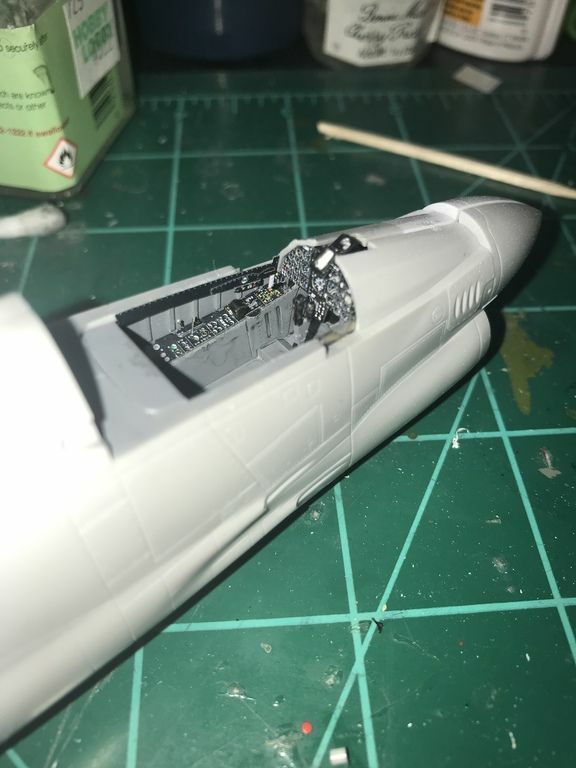 There is still the PE detailing around the canopy to be done, as well as the resin seat assembled and painted, and a couple of tiny fiddly bits (pitot, AoA probe, etc) that need gluing on. It's going to be on hold for a little while though as the Lady Friend's mother is arriving for an early Christmas visit. For now it's taken its place on the shelf waiting "completion" in a few weeks. Weapons fit will eventually be a pair of AIM-9Ds on the shoulder pylons and either Bullpups or Shrikes on the underwing stations. Leaning towards Shrikes for an extra Whif element. Sorry for the poor pic quality...better ones will be along when she's totally done. How am I ever going to compete with that for my RAN version? I almost did my F-20 in RAAF markings.